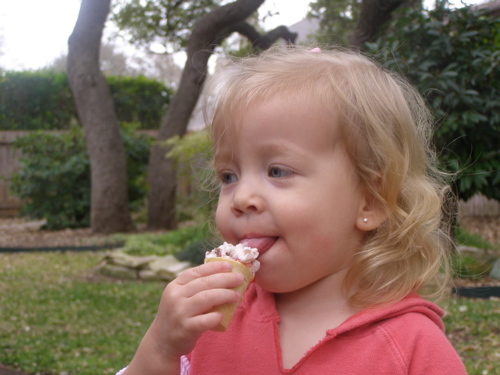 here is a super cute picture of emma eating her first ice cream cone. i always worry that she won’t be able to eat it and choke so i’ve never really given her one. luckily erika had some really small ones so emma tried one. she loved it! i love her little tongue sticking out. 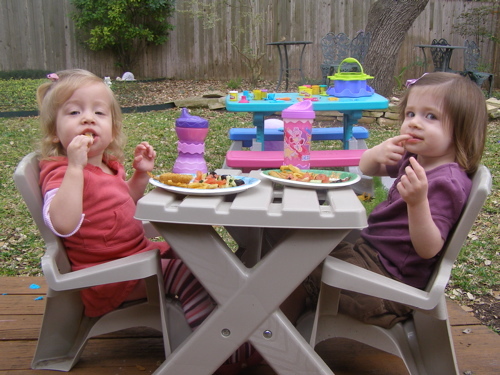 emma and ava had lunch together. what cuties! 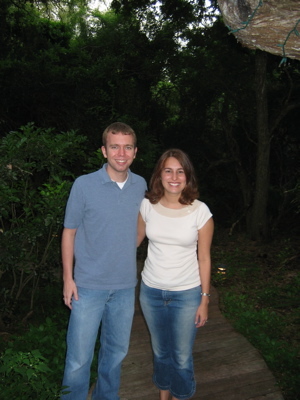 Author denissewarshakPosted on February 24, 2008 Categories photos, the mom1 Comment on ice cream. my daughter is really a boy. so i have a funny story. yesterday emma and i were playing in our backyard. we threw a ball around, she rode her tricycle, and i pulled her in her wagon. so… she is riding in her wagon when all of a sudden she says, ” I got a rock in my nose, Mommy.” WHAT? i didn’t believe her, but i looked in there just in case. sure enough, there was a little gray pebble in there. i immediately panicked. how in the world was i going to get the thing out??? luckily, we have taught her how to blow her nose so i thought she would just blow it out. nope. instead of blowing out, she inhaled and pulled the rock in deeper. it was getting really hard to see it at this point. i envisioned spending the night in the emergency room to get it out. at that instant i remembered all the stories i’ve heard of kids who had through similar experiences. i called ian next. he was down the street at the coffee shop, so he wouldn’t be too long. so there we were, emma still in the wagon with the rock deeper in her nose and ian on the way home. i decided to take her inside and try to yank in out somehow. she was starting to cry now and was even coughing a bit. when we got to the bathroom i found some q-tips. it was probably not a smart idea now that i think about it. the q-tip would have only pushed it in further. i asked her to blow again, and again she inhaled. oh no. we weren’t getting anywhere and i was starting to freak out even more. just then ian showed up. “did you ask her to blow her nose?” he asked. then he grabbed a tissue and put it up to her nose. like a champ emma blew hard and the rock flew out. what sweet relief. the rock was out. no more emergency room. no more crying. daddy saved the day!!! Author denissewarshakPosted on February 19, 2008 Categories the mom1 Comment on my daughter is really a boy. 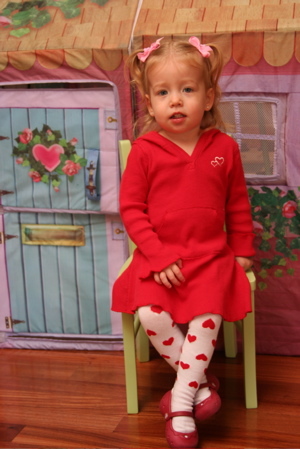 Author denissewarshakPosted on February 14, 2008 Categories the mom1 Comment on my little valentine. i have a confession to make. it makes me sad to think about it, but here goes. 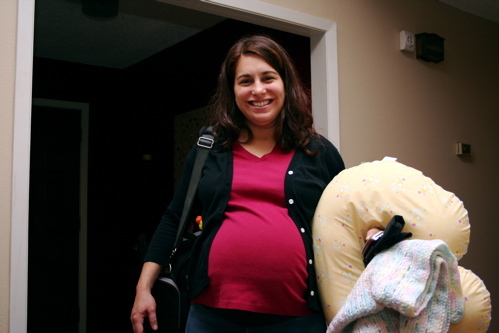 when i was pregnant with emma, i gained 50 pounds… yes, 50 POUNDS!!! that is a lot considering you are supposed to gain between 20 and 30. if you think about it, emma only weighed 8 lbs 1 oz when she was born. i know my placenta was not 42 pounds! i put on the weight of 2 toddlers! looking back on it, i think it was all the juice i drank. sure, i gave myself a free pass to eat more than usual (since i was eating for two.) but the juice… that was the error. i would buy huge 2 packs of orange, grape, and apple juice at costco. and they would be gone in no time. i figured it was all i could drink since i gave up all caffeine. anyway, back to my confession. it has been really hard to get rid of the last bit of weight. so i joined weight watchers this january 2. 🙂 i started off the year with a plan. and i am happy to say that i am doing pretty good. as of wednesday (jan 30) i have lost 6 pounds! yay! its only been 4 weeks, and i decided i will do it for 10 so i have a while to go. here is a picture of me right before emma was born. ouch, right? Author denissewarshakPosted on February 3, 2008 Categories photos4 Comments on confession.